The journey from Nazareth to Bethlehem would have taken Mary and Joseph about a week on foot, it’s hard work, and uphill all the way. Bethlehem was associated with two figures in the Bible: David, Israel’s second king, and his ancestor Ruth, the Moabitess, whose love and devotion to her mother in law Naomi are inspiring. It is a hill town, and source of water about five miles south of Jerusalem, where shepherds would raise sheep for the Passover sacrifice in the Temple, first-born males, holy to the Lord. A fertile, fruitful place, a place of promise. It is a place with the prophet Micah sees as the starting place for a future for Israel. 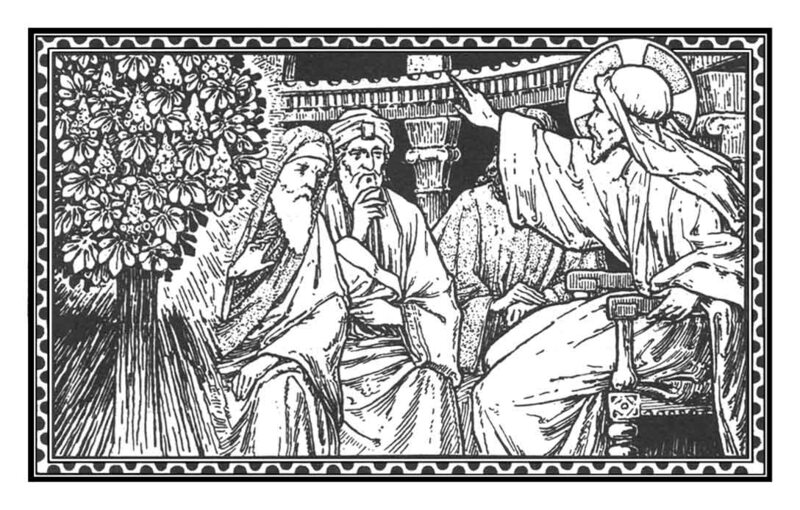 One ‘whose coming forth is from of old, from ancient days’ (Micah 5:2 ESV) The Incarnate Word of God, who has always been, and will always be: Our Lord and Saviour Jesus Christ. The Good Shepherd, who will ‘shepherd his flock in the strength of the Lord, in the majesty of the name of the Lord his God. And they shall dwell secure, for now he shall be great to the ends of the earth. And he shall be their peace.’ (Micah 5:4-5a ESV) He will be our peace, because He makes peace, ‘For in him all the fullness of God was pleased to dwell, and through him to reconcile to himself all things, whether on earth or in heaven, making peace by the blood of his cross.’ (Colossians 1:19-20 ESV) What is prophesied by Micah is fulfilled in Jesus. All scripture points to Him, and finds its fulfilment in Him, the Word made Flesh. In the letter to the Hebrews we see the prophecy of Psalm 40:6-8 fulfilled in Christ. The sacrifices of the old covenant are replaced in the new covenant with the sacrifice of God for humanity. Sacrifice is fulfilled and completed, once and for all. It is this sacrifice, which the church pleads and re-presents. The eternal offering of a sinless victim, to free humanity of its sins, to restore our relationship with God and one another. It is an act of perfect obedience: the body prepared by God for Christ to do His will and sanctify humanity, to heal us and restore us. In this morning’s Gospel Mary does not tell Elizabeth that she is pregnant. By the power of the Holy Spirit, John the Baptist, the last of the prophets, announces the coming of the Saviour by leaping for joy in his mother’s womb. It’s important. There’s no time to waste: Mary arose and went with haste to see her cousin Elizabeth and tell her the Good News. Time is of the essence for us too: not for the frantic fulfilment of consumerism and the world around us: last-minute presents, or enough food to satisfy even the most gluttonous. No, we have to prepare our hearts, our minds, and our lives, so that Christ may be born again in US, so that we may live His life and proclaim his truth to the world. Through the prompting of her son and the gift of the Holy Spirit, Elizabeth can cry ‘Blessèd are you among women, and blessèd is the fruit of your womb!’ Elizabeth recognises that Mary’s obedience, her humble ‘Yes’ to God undoes the sinfulness of Eve. That she who knew no sin might give birth to Him who would save us and all humanity from our sin. It is through the love and obedience of Mary that God’s love and obedience in Christ can be shown to the world, demonstrated in absolute perfection, when for love of us he opens his arms to embrace the world with the healing love of God on the Cross. He will be the good Shepherd, laying down his life for his flock that we may dwell secure. We prepare to celebrate Christmas because it points us to the Cross and beyond, in showing us once and for all that God loves us. So my dear brothers and sisters let us prepare to meet Him, living out our faith in our lives, and encourage others so to do. So that that the world may come to believe and give glory to God the Father, God the Son, and God the Holy Spirit, to whom be ascribed as is most right and just, all might, majesty, glory, dominion, and power, now and forever. Above all, trust in the slow work of God.We are quite naturally impatient in everything to reach the end without delay. We should like to skip the intermediate stages.We are impatient of being on the way to something unknown, something new. And yet it is the law of all progress that it is made by passing through some stages of instability — and that it may take a very long time. And so I think it is with you; your ideas mature gradually — let them grow, let them shape themselves, without undue haste. Don’t try to force them on, as though you could be today what time (that is to say, grace and circumstances acting on your own good will) will make of you tomorrow. Only God could say what this new spirit gradually forming within you will be. Give Our Lord the benefit of believing that his hand is leading you, and accept the anxiety of feeling yourself in suspense and incomplete. Pierre Teilhard de Chardin, The Making of a Mind: Letters from a Soldier-Priest 1914-1919 (New York: Harper & Row, 1961), 57. What Christ did in his own human nature in Galilee, he is doing today … in every city and hamlet of the world where souls are vivified by his Spirit. He is still being born in other Bethlehems of the world, still coming into his own and his won receiving him not, still instructing the learned doctors of the law and answering their questions, still labouring at a carpenter’s bench, still “[going] about doing good” (cf. Acts 10:34-43), still preaching, governing, sanctifying, climbing other Calvaries, and entering into the glory of his Father.